The solar eclipse of 22 July 2009 was the longest total solar eclipse during the 21st century, not to be surpassed until June 2132. It lasted a maximum of 6 minutes and 39 seconds off the coast of Southeast Asia, causing tourist interest in eastern China, Japan, India and Nepal. This was the second in the series of three eclipses in a one-month period, with two minor penumbral lunar eclipses, first on July 7 and last on August 6. 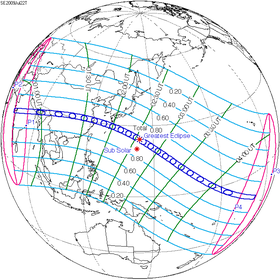 This solar eclipse was the longest total solar eclipse to occur in the 21st century, and will not be surpassed in duration until 13 June 2132. 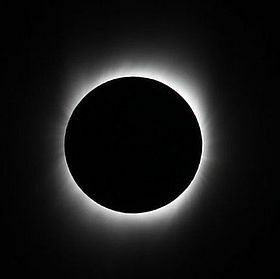 Totality lasted for up to 6 minutes and 39 seconds, with the maximum eclipse occurring in the ocean at 02:35:21 UTC about 100 km south of the Bonin Islands, southeast of Japan. The uninhabited North Iwo Jima island was the landmass with totality time closest to maximum, while the closest inhabited point was Akusekijima, where the eclipse lasted 6 minutes and 26 seconds.